Muriel Gold, C. M., Ph. 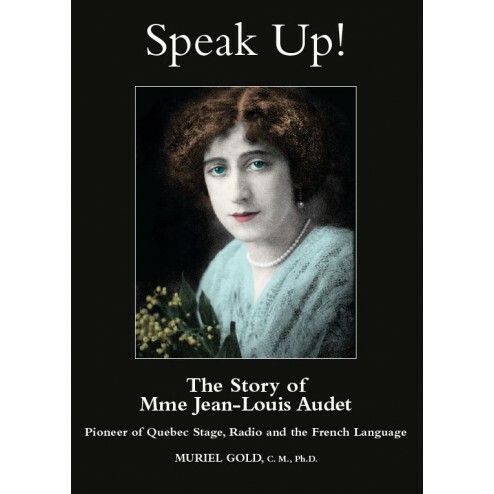 D.
With this book the author continues her legacy as a Quebec theatre historian by introducing anglophone readers to the legendary Madame Jean-Louis Audet who trained generations of Quebecers to value their linguistic heritage. While Madame Audet was a household name in the French-speaking neighbourhoods of Montreal, a regular feature on radio and stage from the 1930s onward, she was literally unknown by English- language compatriots, underlining Hugh MacLennan’s description of Montreal as being composed of “Two Solitudes.” Many of the Québécois stars of stage and screen are the former students of icon Madame Jean-Louis Audet and her famed studio in East-End Montreal. "Without the Audets I would have been a lost child, not because my brothers and sisters and mother did not love me, but because there were no fairies and dwarfs and witches, and there was no Madame Audet." "...elle a étudié le chant, le piano, la claquette la diction, le ballet chez Madame Audet." "Madame Audet was my beloved first teacher in the zone of self-expression." Among her awards and honours, in 2007 Muriel Gold was appointed a Member of the Order of Canada. In her position as Artistic Director of the Saidye Bronfman Centre Theatre (1972-80) Muriel Gold introduced Québécois playwrights, directors and actors to anglophone audiences with a view to bridging the divide between the two cultures.